- New England is 37-17 ATS as a favorite over the last three seasons. - New England is 14-5 ATS in all games where the total is greater than or equal to 49.5 over the last three seasons. - New England is 19-7 ATS when playing against a team with a winning record over the last three seasons. - The Patriots are 1-0 straight up and against the spread versus the Rams over the last three seasons. That win took place in New England during the 2016 season. The final score was 26-10. The total went under. - This will be the first Super Bowl hosted at the Mercedes-Benz Stadium in Atlanta, home of the Falcons. The stadium first opened in 2017. This will be the third Super Bowl played in Atlanta. - Both teams won overtime games in the respective Conference Championship games. The Rams beat the 26-23 New Orleans Saints and the Patriots topped the Kansas City Chiefs, 37-31. Both the Rams and Pats won on the road. 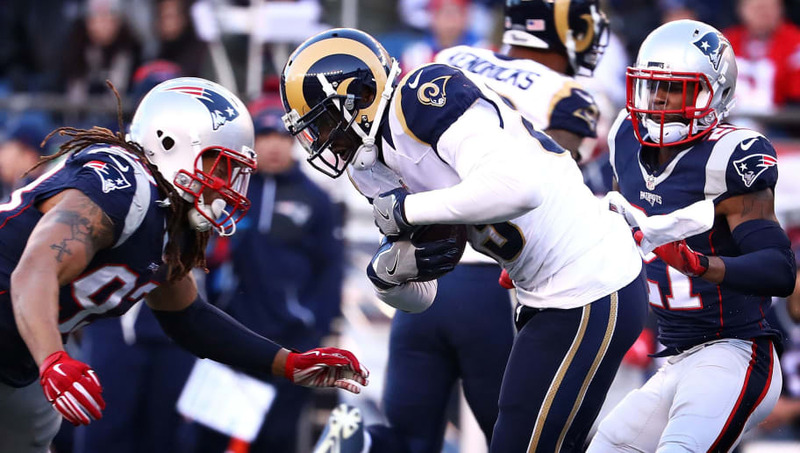 All Patriots-Rams betting odds, lines and props are available on FanDuel Sportsbook. - Tom Brady Passing Yard: Over 284.5 (-108) – This one seems like a gimme given Tom Brady's history in the Super Bowl. He re-set his own Super Bowl record for yards passing in last year's game, throwing for 505 yards. The previous record, also held by Brady, was 466 yards, which came against the Atlanta Falcons in 2017. The fact that there have been three QBs to throw for 400 or more passing yards and Brady has two of them says everything you need to know about this prop bet. - Todd Gurley: Any time Touchdown Scorer (-135) – It's been a tough few weeks for Todd Gurley. C.J. Anderson has seemingly taken over the lead-back role for the Rams, but the one thing that Gurley keeps doing is scoring touchdowns. Despite having just four carries against the Saints in the NFC title game, Gurley did record a TD. With two weeks to rest his balky knee, expect the regular-season version of Gurley to show up in the Super Bowl. David Kaestle is not a FanDuel employee. In addition to providing DFS gameplay advice, David also participates in DFS contests on FanDuel using his personal account, username davekaestle. While the strategies and player selections recommended in his articles are his personal views, he may deploy different strategies and player selections when entering contests with his personal account. The views expressed in their articles are the author's alone and do not necessarily reflect the views of FanDuel.